Whether you use Fleep as an alternative to email or as a team communication tool, it is nice to be able to make it your own. Recently, we added a few new ways for you to start customizing Fleep to your liking. Firstly, you can now modify the left pane in the desktop user interface (web browser, Mac and Windows app). Secondly, you can now play around with labels a little more than before. Making the conversation avatars visible by default was one of the bigger changes to the look of the left pane that was launched with Fleep 2.0. For one-on-one conversations, the conversation icon avatar is the avatar picture of the person you are having the conversation with (unless you’ve changed the Topic for that conversation). 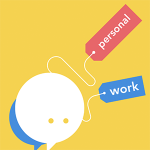 For group conversations and any conversation with a Topic that a user has typed, the conversation avatar will be automatically generated form the initials of the name of the Topic. Now, however, you can decide whether or not you want to see conversation avatars on the left pane in the user interface. If you choose to keep them, you can set an emoji as the conversation avatar. As you can see, the left pane is more compact without avatars – more conversations can be seen in the same space. To make the conversation avatars disappear from the left pane, all you need to do is open your Account preferences and untick the “Show avatars in left pane” option. Try it out! You can always make them reappear with the same setting. Do you prefer to keep the avatars, but don’t like the look of the automatically generated placeholder avatars? No problem, you can change the avatar of every conversation with an emoji! Changing the avatar of a conversation is simple – just edit the conversation topic to start with an emoji, and the emoji will become the avatar of the conversation. In the example above, the Topic of the Project Aurora conversation starts with an emoji, so the emoji becomes the conversation avatar. Labels are a great way to customize Fleep. With the recent update to labels, you now have a few more options for managing your labels. To manage your labels, just click on your profile in the bottom left corner of the interface and choose Manage labels. Here you can delete existing labels and also choose which labels you want shown on the left pane aka the conversation list. As before, you can add and create labels in the conversation, through the conversation actions menu on the left pane or in the Manage labels view. (read more about labels in this blog post). What’s next? We have plans for some further improvements to label management and to customizing the left pane. Stay tuned! Should you have any questions or feedback about customizing Fleep, do not hesitate to reach out to us via Fleep Support or through our social channels (Twitter, Facebook).